Wow thanks for the quick replies! On a non-food related issue, what neighborhood/area do you suggest getting a hotel? Is there a ideal spot to be able to go to restaurants and check out the overall MSP area? Is renting a car a must? Some of the upper end dining, Brasa, and 112 Eatery... I'd rather just eat expensively in Chicago, but for what they are (and especially if you are on an expense account) are very good for Minneapolis, IMO. Are you referring to Brasa Premium Rotisserie? If you are, it is NOT expensive at all. My wife and I had lunch there for $22 for two people and we actually had more food than we could possibly eat. Brasa had the best pulled pork that I have had outside of the Carolinas and Virginia. The sides - cheesy grits, rice and pigeon peas, collard greens and cornbread - were quite excellent. It was well worth the effort of finding it. Schad wrote: Wow thanks for the quick replies! If you are looking for a great deal, ***GENERALLY*** you can get a room at the Hyatt Regency on Priceline for $50-55 and that would put you in the downtown area. We have spent several weekends in Minneapolis WITHOUT A CAR. It limits your ability to get around the area QUICKLY; however, it is doable, The transit serves Minneapolis, St. Paul, and Bloomington and many of the suburbs. I like the University area BUT hotels are less common over there. Trung Nam French Bakery serves a variety of croissants (the coconut one I had [$1.75] was delicious, with a surprisingly decent consistency...it's not going to put Eric Keyser to shame, but is certainly very good for the price and locale) as well as a single variety of Banh mi in either regular or deluxe (extra everything) versions. The deluxe will set you back less than $5 and it's a pretty healthy sized baguette stuffed with tofu strips, red BBQ pork and pate, topped with pickled carrots and radish, cilantro, mayo and raw jalapeño slices. There are some smoothies/shakes on the menu, too...including durian, though I'm not that brave. Service is not a priority, but it's not intentionally bad either, just a bit slow and disorganized. This will be a once-a-week spot for me for however long I'm in the Twin Cities. Little Szechuan was somewhat of a let down for lunch, but there seemed to be enough potential that I will be going back to explore the menu at dinner. There's a $7.50 lunch special that comes with Hot & Sour soup (decent), egg roll (sad), rice and your choice of entree (a serviceable, if rather mild, twice-cooked pork in my case). The cabbage and bell peppers were fresh and flavorful, but the pork was pretty unremarkable...I won't complain for the price. Service was slow, we had to ask the bus boy to find our waitress so we could order and then actually get up and track someone down to get the check (had to get back to the office for a meeting), but the place did seem to be doing a pretty healthy business, so perhaps they were just caught short staffed. Given the wealth of good reviews and recommendations I received for the place, I'm willing to give it a go for dinner, but I'm keeping my hopes in check, particularly with how frequently I find myself at Lao Sze Chuan these days. Despite initially thinking I wasn't even going to get to eat there, I instantly fell in love with 112 Eatery. The look and vibe, but even more so the smell, reminded me of places I've visited all over the country that tend to be(come) cook/service-industry hangouts with no nonsense, terrific food. It was like an even cozier branch of Blue Ribbon Brasserie on a relatively nondescript street a few blocks away from the ballpark. The place was jam packed with the pregame crowd, every seat at the bar occupied. Thankfully, before I scampered off, the hostess clued me in that they had a second dining area and bar upstairs...so, back out the door, down the hall and up the elevator. Same cozy yet frenetic environment, but with a few open seats at the bar and a view that wasn't just bumper-to-bumper baseball traffic...even better. The bartender made me a very good Negroni. I'm a cocktail snob, so I'll take points off for the fact that it was shaken and wasn't garnished, but not for the fact that it was served up, though I prefer mine on the rocks (I'll specify next time). Still, it did the trick. Complementary candied & spiced nuts and marinated green olives were made available while I looked over the menu. I ended up ordering the romaine leaves with Roquefort dressing, the 112 steak tartare (there is also an 'unprepared' steak tartare on the menu, allowing you to mix the meat and garnishes as you prefer...the 112 is the chef's chosen embodiment of same) and the cauliflower fritters. Service was attentive and efficient, yet casual and relaxed. Where I ended up sitting it was a bit awkward to talk across the bar, so the bartender came around to answer my questions and take my order. The salad came out first and was absolutely perfect in its simplicity. Less creamy than Roquefort in the classic sense, the crisp hearts of romaine were dressed in a light vinaigrette studded with unctuous bites of some of the best blue cheese I've ever had. The plate was also lightly sprinkled with toasted bread crumbs, only vaguely discernible on the palate compared to the cheese, but brilliant as textural contrast. The tartare and fritters arrived together. The steak was great, clearly high quality beef mixed with bright, flavorful accompaniments. It was also an extremely generous portion. I would have preferred the bread it was served with to be both fully toasted and cut thinner. It was, basically, slightly browned slices of baguette, fine but not ideal. I probably could have done without the fritters. They weren't really fritters anyway. It was florets of cauliflower that were, perhaps 'frittered'? There was no batter to speak off, however. It was nicely browned cauliflower pieces more-or-less covered in grated cheese. A vegetable that I quite like, but not a preparation that I was sold on. Desserts looked tempting, but I couldn't do it. Still, a complementary dish of what was essentially house made cracker jack, flavored with what I supposed was pumpkin pie spice, arrived with the check. It was a pleasant surprise, which sums up 112 Eatery itself. I will get back as often as I am able. Eating at Brasa Rotisserie reminded me a lot of hanging out at the first 'build your own burrito' shop that opened near the college campus where I grew up (a progenitor of the Chipotle/Qdoba nexus, but years before either were established national brands). There's a bunch of college kids making food that is way better than it needs to be (for the price) in a relaxed (though bordering on 'tragically hip') atmosphere. You can sit on the patio and enjoy a pint of local beer and perfectly moist cajun-rubbed rotisserie chicken with a side of rice & pigeon peas with ham sofrito that tastes like it was plucked from the kitchen of your favorite jibarito place, maybe better. Oh, then there's a special slab of smoked brisket and a honey glazed cornbread muffin, both of which rival anything available anywhere for the cost... Sure, it feels like you have to con them out of to-go containers (so not Green, man), but you've got a whole chicken breast and nearly a pint of rice & peas left, and they're definitely going to get eaten later that night. Oh, yeah...and your tab is less than $20. Can anyone recommend a good location to watch the football game this evening, preferably downtown? ETA: Ended up at 8th Street Grill on Marquette & 8th in Minneapolis. Lots of enthusiastic folks wearing Packers gear, a few more reserved Saints fans. Excellent list of tap beers. I particularly enjoyed the Surly Furious. 112 Eatery is very good for Mpls and I have yet to have a bad experience there. Typically solid. Bar LaGrassa is also very good. Same owners as 112 Eatery. Haute Dish - Pretty good, you could do worse. Bachelor Farmer - Haven't' been but good buzz around town. The governor's kids own this place. Ike's - Not a bad burger place. American food, large portions - nothing spectacular but you shouldn't be too disappointed (there's also one at the airport). Blacksheep - Pretty good pizza. Bars - the Local and Brit's are usually pretty good. Restaurant Alma - Very solid. Same owner as Brasa but a bit more upscale (not fancy though). There are probably a few other places but I can't think of them right of the bat. Bars - Nye's Polonaise is a nice throwback kind of place. The Bulldog has a decent selection of beers, including Belgians. Tilia - Very solid little place. No reservations. Piccolo - Small plates, small place, very good. Need reservations. Heidi's - Also very good. Controversial chef but very solid food. Pizzeria Lola - Best neo-Neopolitan style pizza. I don't go into St. Paul too often but I've been to Heartland. Interesting place but was a bit underwhelmed by the meal. I've been to Alary's Bar, which is a Bears / Cop bar in St. Paul. Unfortunate Hooters style uniforms, very tacky but it'll always have the Bears game on (which is why I mention it here). The University area also has some decent bars - Town Hall Brewery is a best bet. Right across the street is Republic. Next to the U of M stadium is Stubb and Herb's. All have great beer lists. Beer - drink local here. Surly Furious and Hell are both good but they have others that may suit your palate. Fulton Brewery's Sweet Child of Vine is my favorite IPA here. Not too hoppy, just a good drinking beer. Summit usually has a few releases that you can't get anywhere else. I'm missing a lot here but hopefully it'll get you started. Very nice list. I just moved to MSP about 6 months ago and have worked my way through quite a few of the places you listed above. I would also add Corner Table to your list in S. Minneapolis. A couple places I've been pleasantly surprised with recently was Wise Acre Eatery around 54th and Nicolett...fantastic, affordable, farm-to-table restaurant and Sonora Grill which is in the Midtown Global Market and is a very good, XOCO-esque type of place. Both are worth a shot IMO. It's funny how when you live in one of the cities here, you don't go to the other much! I also agree on your comments regarding beer here in the Cities. A fantastic beer culture that is getting stronger with the recent additions of Harriet Brewing and Steel Toe Brewing in STLP. Surly's stuff is awesome, even more so with this week's release of their Surlyfest Beer! It sounds like you've spent some time in South Mpls. If you're in the neighborhood, another place worth going to is Cafe 28, in Linden Hills. It's co-owned by Surly's head brewer so much of the Surly line can be found on tap. Burgers made with beef from Clancy's butcher shop (around the corner) and a lot of local farm products, it's a good casual place for lunch or dinner. I've also heard great things about In Season but sadly have not yet been to that place either. I'd have to say that the farmer's markets are really strong here. In So Mpls, Kingfield and Fulton both are pretty good on the weekends. I'm looking forward to apple season. As you may know, the Honeycrisp was developed at the U of MN. There are some local orchards that are great in the fall and Honeycrisp and Jonathan apples abound. I live west of Minneapolis out around the Lake Minnetonka Excelsior area. The University of Minnesota Landscape Arboretum is just directly south of us and they have a fall seasonal store called the AppleHouse where apples and other produce are sold direct from their orchards. I stop in a couple of times a week since I Nordic walk at the Arboretum or nearby Carver Regional Park. They started out with experimental numbered apples, then Ginger Gold, Sweetango and Zestar this week along with several others. The Honeycrisp apples haven't appeared yet. I hope they show up this week. They say this year is a great year for apples in the Twin Cities. So far I can corroborate that. The apples I mentioned were all developed at the Arboretum. The Arboretum no longer has a pick your own setup. We're going down to La Crescent in southern Minnesota on the Mississippi River this weekend to a pick your own orchard with our grandkids. La Crescent is billed as the Apple capitol and has an Applefest this weekend. Here is an update to my remarks on apples from the University of Minnesota Horticultural Research Center at the Arboretum. This article showed up in the Minneapolis Star Tribune this morning and is one of the best I've read about how apples are developed there. Davydd - Thanks for posting this info. It will come in handy. The weather has cooled off and I'm instinctively craving apple crisp and apple pies. Who knew there were this many LTH'ers around the TC area? I had some outstanding food last night at Ngon Bistro. Just when I'd given up on finding the equal of the grilled pork patties that floored me in Hanoi, here they are in Ngon's Nem Nuong. A grilled pork sausage patty atop a slice of airy baguette and below a fried egg. The runny yoke marrying with the streaks of sriracha made an excellent sauce, but the pork didn't need it...one of the best things I've eaten in some time. The goi cuon were good and the bun w/ grilled pork (slices, not patties, but similarly spiced and grilled) was excellent, though both the spice and fish sauce quotients were at the low level of acceptable. Had service been more attentive, or applicable condiments provided on my table (some other tables had sriracha and hoisin, but no fish sauce as far as I could tell), this wouldn't have really been an issue. Classic Vietnamese flavors/dishes in a comfortable setting with a focus on local products (including a great list of local tap beer), yes this is a restaurant concept I'd love to have in Chicago. Mitch Cumstein wrote: Travail amusements and eatery in robbinsdale is definetly a good spot. Understatement of the decade, so far. They crushed 18 courses for us last night. Highlights included a beef tartare/carpaccio duet, agnolotti with potato skins, corn soup with jalapeno mouse, sweet & sour sweetbreads, dehydrated red wine with apple and blue cheese emulsion, and everything about dessert (pumpkin pie, mocha mousse, fresh doughnuts, chocolate covered bacon...) We were amazed, and very happy we stuck around (waited 75 minutes for our table, despite arriving at 5:30* and being the first 4-top on the list). After tipping heavily, we went across the street to the liquor store and bought a bottle of whiskey for the kitchen, which seemed to go over well. *They open at 5, but we were told people have been lining up as early as 4:00 since they were named #4 Best New Restaurant by Bon Appétit. 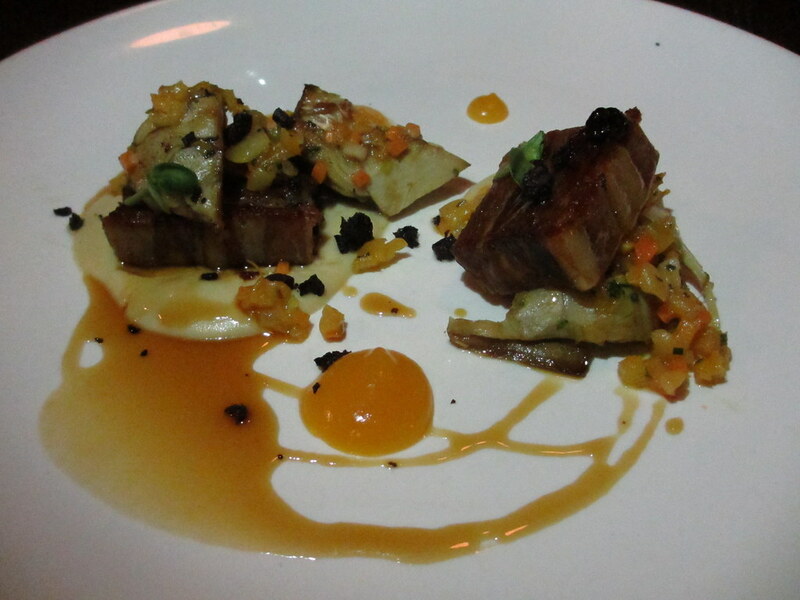 ETA: Vibe and service were Schwa-like, but the place is certainly most 'rustic'. Given the cost ($35/pp for 10-course tasting menu for 2), that's not surprising. With my first LTH forum, I want to recommend Kramarczuk's Ukranian Deli on East Hennepin Avenue in Minneapolis. To get there, you walk on Hennepin East until you cross the Mighty Mississippi, then continue about 3 more blocks. You can't miss it. Depending on where you are, you might want to take a Taxi. Kramarczuk's has some of the best sausages you will find outside of Europe. Their garlicky Ukranian sausage is the best sausage I've had anywere on the planet. They have a great range of Eastern European foods. http://kramarczuks.com Oh, and they now have an annual "Sausage Fest." Welcome to LTH, JADBP, and thanks for the info! Davydd wrote: They started out with experimental numbered apples, then Ginger Gold, Sweetango and Zestar this week along with several others. Man, I cannot stop eating these Sweetango apples. They may be the best apple I've had. Great combination of sweet, tangy and juicy. It just doesn't get any better than this. Besides for the arboretum, these apples can be found around town at some of the grocery stores. I've seen them at the Linden Hills Co-Op and Byerly's but didn't see them at Cub Foods or the farmer's market (Fulton last week). I agree. They make a heck of a sausage. They also sell them at Twins games at two small booths. Made it to the last Twins game of the season (they won, 1-0 over the Royals, barely avoiding the inauspicious 100 loss mark) and tried the Kramarczuk's bratwurst. A mighty fine sausage, topped with sauerkraut that had a great amount of tang. MSPD wrote: If roast beef sandwiches are your game, and you happen to be in MSP, Maverick's in Roseville (inner-ring suburb north and east of Minneapolis) is a must-visit. Maverick's has been a regular lunch spot for me for the past couple of weeks. I'm not sure it's a place I'd drive very far out of my way to get to, but in comparison to the usual chains that are available in the area it's certainly top notch. Their French Dip is excellent, and I love the condiment bar loaded with peperoncini, giardiniera, horseradish and pickles. Service is no frills, though they try to be speedy and occasionally even inviting, but the deep fryer is constantly backed up (even though they ask you if you're having fries the second you walk in the door). I was chatting with one of the owner's today and he was asking if I'd been in before and how I liked the brisket, etc. 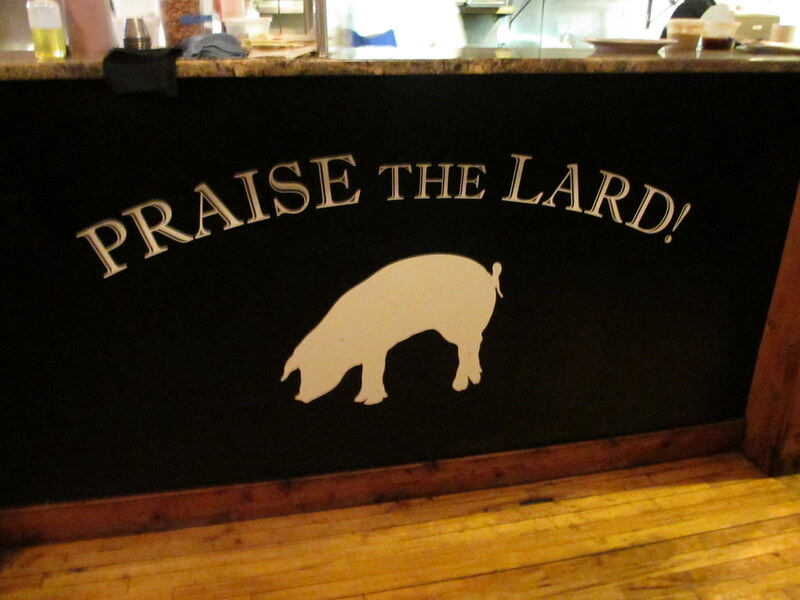 I mentioned that it was good, but that I had preferred the French Dip on previous visits. He offered to go back and make me one as a replacement. The brisket was perfectly fine, so I didn't take him up on it, but the gesture was appreciated. I crave Mexican food upon returning home to Chicago after any length of time away. From Topolo to Zaragoza, I've yet to visit a city that can compare with the breadth and depth of the offerings here. So, when a co-worker suggested a few weeks ago that we try a restaurant he'd heard about inside a Mexican grocery in St. Paul I wasn't expecting anything to write home (or on LTH) about. Sure enough, the cafeteria style place turned out a serviceable plate of tamales, but I didn't feel any need to direct any traffic their way...that all changed on Tuesday. It was a rainy/cold day and I had the itch for something spicy, so I figured I'd give El Burrito Mercado a second try. Be it dumb luck or divine intervention, the Tuesday special for the month of October is Carne en su Jugo. The vivid green broth, covering thin-sliced beef & bacon with firm pinto beans and roasted knob onions was great. The deeply flavorful stock (beef based with blended tomatillos) had a just barely sweat-inducing level of spice, occasionally cut through by the fatty bacon and the somewhat-charred, somewhat-crunchy whole onions. I know where I will be next Tuesday...sadly, October does not have 32 days. The Arboretum Apple House had a bumper crop of apples this year. I was in Friday and loaded up on a 30% off end of season deal. The apples were so good that even the second grade apples were mostly unblemished. The Snow Sweet apples are late arrivals. They are very sweet and crunchy with a white appearance and seem to keep well. They close for the season tomorrow (November 6). In past years they've closed closer to the middle of October. I've been busy slicing and drying apples with an air drier. I dried about 48 apples so far. My wife has been making apple sauce and freezing it. Bar La Grassa - From the folks behind my local favorite 112 Eatery, an Italian place. Great pastas, awesome gnocchi with cauliflower and orange. Charcuterie plate was a little ham handed and the wine list didn't excite me (this might just be my preference for France over Italy showing), but I will return to explore more of the menu. Interesting bar seating overlooking the open kitchen, great for solo dining. Tilia - Quaint place in a beautiful area. Delicious but somewhat forgettable food. Decent rillettes, Brussels sprouts...pastas that didn't quite hit the same level as BLG. Great local beer list. Piccolo - Very interesting food, with great textural contrasts, but flavors were sometimes sacrificed (thinking of the chestnut tartare with bone marrow, 46 degree yolk & Worcestershire, here). Still, if combos like scallops with chanterelles, monkfish liver, Brussels sprouts and chorizo or quail with farro, artichoke, quince & Braunschweiger interest you, this is your spot. I haven't seen this level of creativity anywhere else in town (except maybe Travail, but even that was more 'riff-y' than truly inventive), and the execution is awfully good. Great variety on the wine list and a nice carafe option (2.5 glasses). Pizzeria Lola - Super popular localvore thin crust place with a Korean spin. I stumbled in here during what was apparently a semi-private event on a day they weren't usually open to the public, but was greeted with warmth and hospitality and even served Cheerwine. Even if the pizza with housemade Korean sausage, kimchi, serranos, scallions and sesame oil hadn't been fantastic (it was, though the crust was not quite to Coalfire levels of crispness), I'd have made a note to return simply because of the friendliness of Chef Kim and the vibe coming off the great group of regular patrons who were there celebrating something or other with her. A roasted cauliflower app with Calabrian chili had a slight tang to it that might have been a bit of fish sauce in the chili pickling liquid, it was great and unique. Next time I'll be sure to try the meatballs, which the couple next to me were ravaging as I left. Peninsula Malaysian - My first real experience with Malaysian food, though I've been introduced to a lot of the concepts and flavors by Singaporean friends. Still, I wasn't entirely prepared for the pungency of the belacan (dried chili and fermented shrimp/krill paste) on offer here. The roti canai was great, still steaming when it was brought to the table, served with a curry sauce with chunks of chicken and potato. When I ordered the sambal udang for my main, the waiter inquired as to whether I'd tried their sambal before. I said no, but that I didn't mind spice. He said it was not too spicy, but strong and asked if I wanted to taste it first. I didn't think that was necessary. However, as the plate approached the table I had andouillette flash-backs, something funky and wharfish this way came. Thankfully, I was able to get past the initial connotation and dig in. It was a deliciously complex and layered flavor. Funky, yes, but also intensely rich and both sweet and sour. The shrimp were shell-on, which added a nice textural contrast. I'll be back, but I'm not sure I'd order it again (the menu is quite long and very diverse), though it was certainly worth trying. Went to Heartland Market and Restaurant in St Paul and Bar La Grasa in Minneapolis. Both were excellent! Also there is a food court indian restaurant in Nicolett mall that is very authentic and good! Not high end by any means. Just real indian food. Very inexpensive too. Nice little suprise. The James Beard Award committee and a number of LTHForum posters seem to agree that 112 Eatery is among the best restaurants in the midwest. Based on 2 meals I've had there, I think it's terrible. Sauteed escarole so ridiculously drowned in butter and unbalanced by what seemed like 3 cans of unrinsed, unpalatable anchovies. Chewy sweetbreads served with chewy porcini mushrooms and chewy clams with more than a hint of grit. A famous foie gras meatball pasta dish where the balls and pasta were fine, but nothing about the generic cream sauce brought them together and it was way oversalted. Sorry to hear 112 didn't live up to the hype...my time in MSP is at an end for the near future, but I did make repeat visits to Bar La Grassa and Peninsula last week before getting out of town. Peninsula served up a delicious, if extremely fatty, bowl of beef brisket curry noodle soup and an interesting app of "shrimp puffs" that was essentially crispy shrimp in mayonnaise, but the shrimp were wrapped in bacon before being fried. Definitely a crowd pleaser, that one. The trip back to Bar La Grassa was terrific. In a larger group, I was able to sample a much broader array of dishes. Bruschetta with anchovy, avocado & sea salt as well as one with eggs scrambled with lobster and truffle oil were both excellent, both rich in their own way, the former in its simplicity and the latter in its decadence. We had the gnocchi with cauliflower and orange again, but tasty as it was, it was upstaged by two more intriguing pasta dishes. The fusilli itself was terrific, but the accompanying lamb meatballs were awesome in a beguilingly simple tomato sauce that had us guessing until the end of the meal when the chef identified the mystery spice, turmeric (disclosure: a member of my party used to work with the chef, who sent out a plate of various grilled sausages--hit or miss--and stopped by to chat at the end of the meal). But, the squid ink "pasta negra" with uni, mussels, tomato and serrano pepper was the standout of the evening, a perfect taste of the sea with a bit of a kick. The NY Strip was very good, but nothing special...a safe choice for the less adventurous, but something of a waste of valuable table real estate compared to the more unique dishes. Ordering wine by the bottle made things a bit more interesting than my last visit in that regard...a Vouvray to start, followed by a Nero d’Avola, both very tasty and relatively cheap (could certainly do much worse for $30). I hate to say it but it doesn't get much fancier than blue jeans while in Minneapolis, so you'll be fine. I don't go down to the "U" too often so I'm probably not the best source but I would say that within walking distance, you should have Al's Breakfast (voted best pancakes in the U.S. by Esquire recently) and maybe a Punch pizza location (Neapolitan style). A good bar that also serves food (so it'll be safe for the under age) is Stub and Herbs and it's right by the stadium. You'd want to go there for micro / local beers and probably not food, so I'm not sure if that would fit the bill for you on this trip. There's a really good public transportation system here and if you wanted something a little better, but still in the general area, you may be able to get to Restaurant Alma, Town Hall Brewery, or Republic. Hopefully, the weather will hold out for you. We've had a mild winter so far with very little snow. Enjoy the trip and please check back if you find anything worth mentioning. Nobody has mentioned Victory 44 yet. Today marks my first time visiting Minneapolis and I had an amazing meal here tonight. I think Chef Erick Harcey is doing a great job democratizing good food in Minneapolis. It's a little out of way in North Minneapolis, but definitely worth a trip. We didn't have a problem getting a table for four at 7 pm Thursday night. The quarters are a little close, not as bad as Avec, but it can be tight maneuvering through the restaurant. Victory 44 is a gastropub akin to Owen & Engine or Girl & the Goat. We each had the 3-course chef's tasting menu for $28, which meant we could choose any appetizer, entree and dessert from the menu. This was really a steal for the quality of food we received. 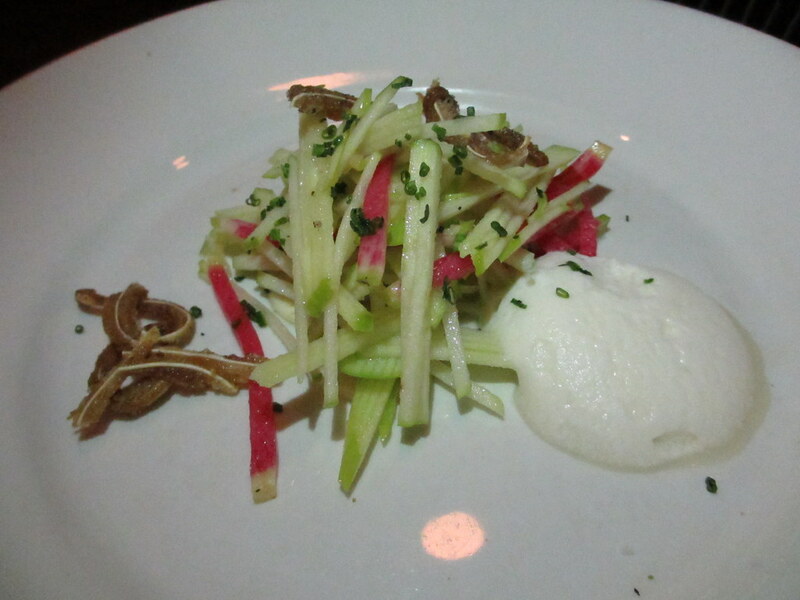 Apple Salad - apples, celery root, radish, Taleggio espuma and fried pig ear with vinaigrette; very light and tasty! The ear was the perfect accent. Lamb Terrine - artichoke puree, artichokes, brown butter, apricots and apricot gelee...the little charred bits are lamb bacon...so good! This was not at all like the chilled terrines I am used to, with chopped ingredients scattered throughout. Instead, this was a pressed lamb terrine. 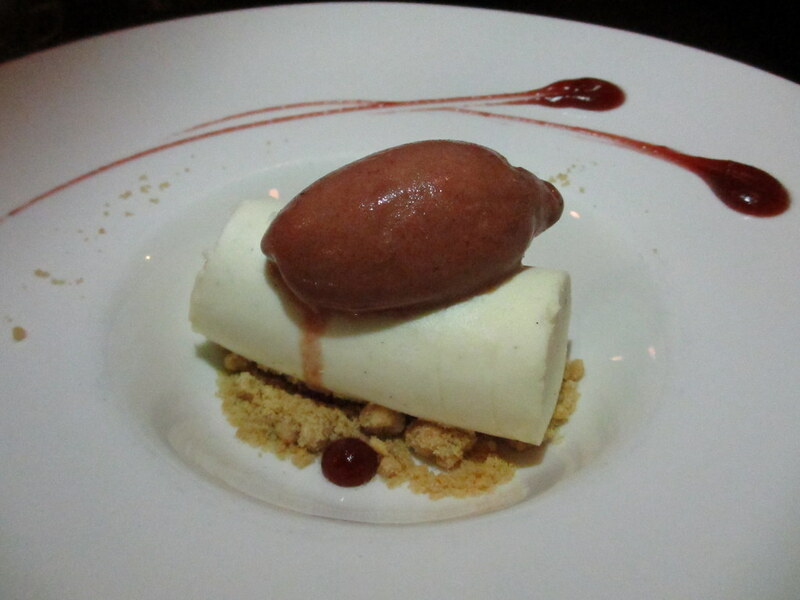 Chevre Cheesecake - almond streusel, cherry gelee and black pepper cherry sorbet. The cheesecake had a very light, whipped, texture, making it the perfect backdrop for the sweet crunchy streusel and tart cherry. Spent the long weekend in Minneapolis. Enjoyed a wonderful meal at the Bachelor Farmer. Amuse bouche was tiny fresh radishes with salt and butter - so simple and tasty. They have amazing popovers served with honey butter. They are huge, crispy on the outside, light but substantive and served piping hot. Most of us had the cod, sauteed served with dill mashed potatoes and asparagus. One friend had the sausage which she really enjoyed. Everything was perfect. We had no room for dessert but they comped us a slice of chocolate cake, which was dense, chocolatey but not too sweet or rich. My parents made some polish and bratwurst sausages from Kramarczyk's deli on Saturday and we bought some home. These are the best sausages I have had, up there with Gene's and Paulina. Garlicky, juicy but not greasy, good quality meat. We began the evening downstairs at Marvel bar, a very cool cocktail bar. Drinks are interesting combos of unique flavors- we had a drink with pickle juice as an ingredient that was very refreshing, well balanced. I can't remember the rest of the ingredients. Maybe I am just getting old, but I do find the no sign, having to go through several doors thing a bit annoying, but it was definitely worth it. Had some great beers in MN as well. Fulton Sweet Child of Vine is a slightly bitter, hoppy IPA we enjoyed. Of course we had several of our favorite Surly Furious and were happy that we were in town for Surly Hell release, the only beer I have had in the US that tastes like the lagers in Germany. Spent a half hour at Surdyk's, which is one of my favorite liquor/cheese stores. I was in Minneapolis this week for work, and have been to some of the newer restaurants downtown, such as Bar La Grassa, 112 Eatery and Restaurant Alma. I was told about The Bachelor Farmer by my wife (who also travels for work) and made a point to dine there this time up. Since I was there Tuesday for work, staying overnight and returning to Chicago early Wednesday afternoon, I decided to hit up TBF for dinner and pop my "Juicy Lucy" cherry the next day before flying home. I arrived at TBF around 8pm on a Tuesday and it was fully seated. I went to the bar (I love dining at the bar of a restaurant when traveling solo, and also with my wife sometimes) and even though it was full upon my arrival, I was able to get a stool within 10 minutes. I needed a cocktail after my day's work and was eyeing their house cocktail list, deciding between a Vesper and a Martinez. The bartender, Mike, quickly said MARTINEZ! which was enough to convince me. This is a classic cocktail recipe of gin, maraschino (Luxardo here), bitters and sweet vermouth. It was quite delicious, savory and refreshing. While sipping my drink (and munching on the amuse bouche of breakfast radishes, butter, salt and housemade crackers), I perused the menu and wine list (they offer a reserve list of rare/older wines in addition to the main list which is fairly focused, but very well-balanced. They offer cool-climate wines from around the globe, but focused on Europe. Considering their menu is Finland-inspired, this makes sense. The menu is divided into appetizers, toasts, and entrees. The "toasts" section are basically spreads, pates, tartares and such that are served with appropriate condiments and...well, toast. I skipped the toasts portion and went with a sugar snap pea salad that included local-ish cheese, walnuts and herbs from their rooftop garden. As for entree, they were offering sockeye salmon, grilled pork sausage, roasted chicken, etc. but I was intrigued by the Weininleike, a Finnish dish similar to a German schnitzel, but made with pork instead of veal. The salad was bright and flavorful, the essence of spring/early summer. I also was talked into a side of "bag o' mushrooms" by bartender Mike. It was worth the $7 price, and this version had oyster mushrooms exclusively with a light but savory sauce with a touch of cream, me thinks. I had a delightful glass of Jurançon (SW French white) with the salad, and a Fixin red burgundy with the entree, both paired very well. I didn't have much room for the desserts, as lovely as they all looked on paper...but a $3 scoop of strawberry sorbet with olive oil and cracked black pepper would not take no for an answer. Mike suggested a small glass of Rivesaltes (SW French dessert wine) and it was a MAGICAL combination! My flight was at 1:45pm the next day, which gave me time for an early lunch...I had been told by friends to try the local original "Juicy Lucy" which is a hamburger stuffed with cheese...the cheese melts and oozes out of the burger, much to the diner's delight I suppose. There are two spots that contend to be the "original" place for the JL - Matt's Bar and the 5-8 Club. Since Matt's was closer, I chose that spot. The bartender asked if I had been here before, and when I said no she then advised that I wait 3-4 minutes to bite into the burger so as not to scald my mouth with the molten cheese...wise words. The burgers are fried on a flat-top grill at the end of the bar, short order style, and they are delicious. You can get a regular burger for $3.95...but why would you??? Burger Jones and Colossal Cafe (also a DDD pick) mentioned upthread were excellent again as well. Yeast-fragrant malted pancakes were a special delight at the latter, along with the pork medallion sandwich. Hitting Bachelor Farmer tomorrow.